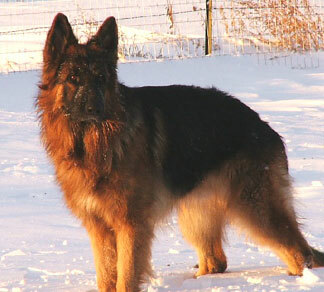 This is our GSD Nicoh (ANICOH GESCHENK VON DEN WEGEN) on a cold Halloween morning. He absolutely loves playing in the snow. Nicoh just turned 3 years old. He is a large boy measuring 28" at the shoulder and is a slim 83 lbs. He likes (and needs) to stay busy. Nicoh loves Agility, Sheep Herding and playing Fetch but is happy doing anything with his family. We have been working (or playing) mainly with his agility training and have done a few trials at the novice level. He amazes us in how agile he is for a dog of his size.